Worry. So much to worry about – so little time. Food, shelter, clothing. A steady job to pay the bills. Family and friends to love. Physical safety and good health. A future that’s prosperous and happy. And world peace. The list could go on and on, and it does. It starts typically with the small world of ourselves and our loved ones and moves out from there. So what’s wrong with that? Are we not to care/worry about what we want or have been given and are trying hard to manage as a good steward? That even sounds Biblical. What’s the problem with being concerned about one’s needs, wants and desires, expanding current holdings, and caring for loved ones? How can one not worry about any or all of that? It is the human struggle as we do greatly toil and spin. The good news is that there are answers to solving this burden and winning the war over worry. Worry is a function of our thoughts and circumstances created or replayed in our minds. The clear mandate is to not worry and put our trust in God. That sounds good but how do we really manage this? 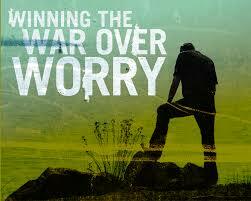 As simple as it may appear, there is a scriptural prescription for winning the war over worry. Jesus references flowers (lilies) and their beautiful existence without angst or toil and our significantly higher stature as humans in God’s creation. He then follows with the dictate: “Seek first the kingdom of God and His righteousness, and all these things will be given to you as well.” – Matthew 6:33. Between his caution about low and high things plus a proactive call to live a greater vision, there is an answer here to our worry. It lies in our own spiritual integrity which involves our body, our mind, and our heart. Mind Fuel – The mind is our personality command center. It’s where our intellect, will and emotions come together to form our essence and soul. Our mind is to be fed with the living Word of God (Psalm 119:11,16, Proverbs 30:5, Hebrews 4:12, 2 Timothy 3:16, Romans 12:2, James 1:21-22). A well-fed mind is sound and quick, sharp and alive with a healthy and balanced flow of emotions. Heart Alignment – The heart is our connection to God. It’s a spiritual thing, where our spirit is united and connected to the Holy Spirit. This is what is reborn at the point of faith and belief in the free gift of forgiveness and Lordship of God. A fully surrendered heart is rightly aligned with God. Anything less than 100% surrender is out of alignment. If God is all that we know of Him, then what is worry but doubt and even disbelief that He will care for us in the short and long-term. It is us, the foolish ones who teeter and waffle while God is always steadfast. He doesn’t change or falter. Oh, we of little faith! In practical terms check our own daily personal spiritual integrity: Are you rested and caring for the body/temple? Are you feeding and shaping your mind with the Word of God? Are you surrendering your heart/spirit to His Lordship? Do so and let not your heart be troubled with worries, large or small. Are you moving from worry, doubt and disbelief to rest, trust and full peace? Dreams Shattered. What Do You Do? Running the Race to Win, Place, or Show? Peace that Surpasses Understanding. Really?